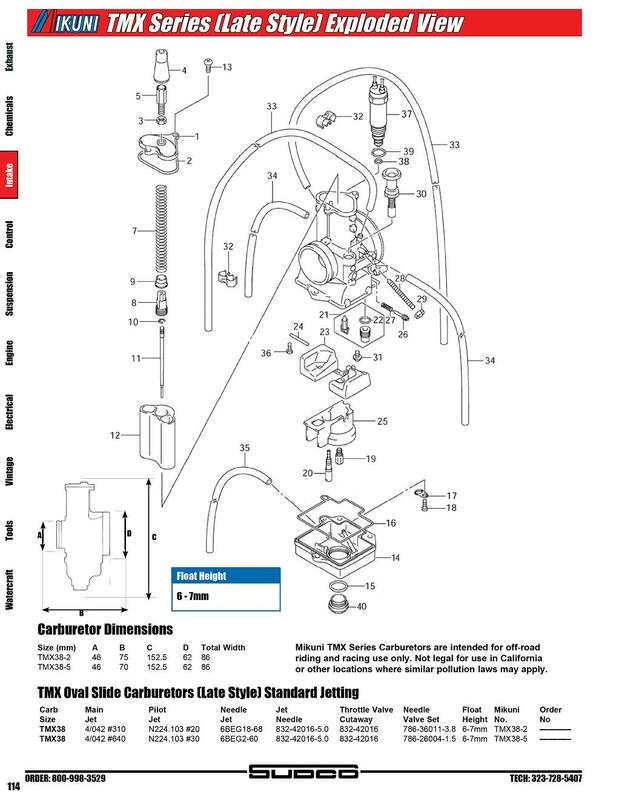 Although this was done on a 2001 CR250, the same basic principles apply to most carbuerated bikes. 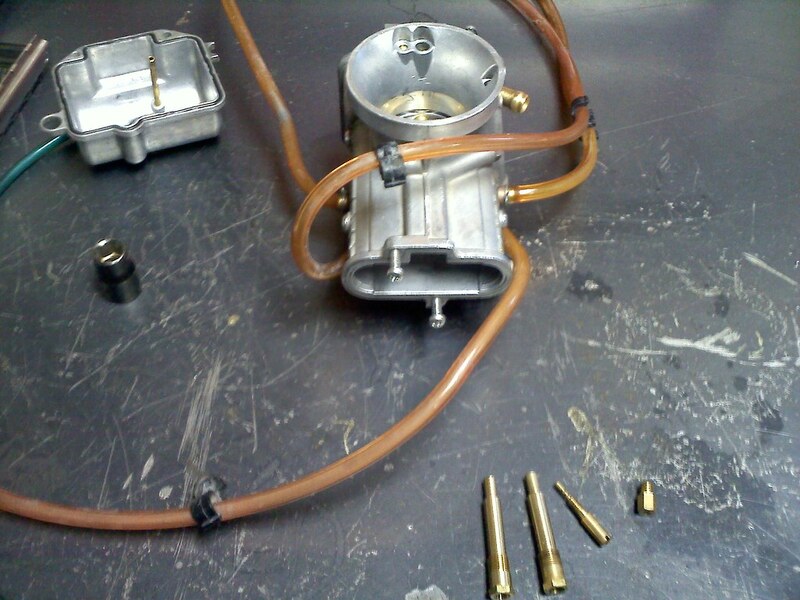 In a previous post, "Carb Jetting Basics" I explained why jetting is important, what factors affect jetting, and how to do basic jetting adjustments. 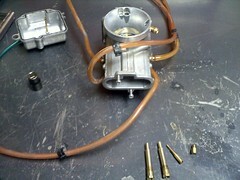 I also stated that in most cases when doing jetting the needle and/or the needle jet does not need to be changed. Although this is true, there are conditions that do require a needle and/or a needle jet change. 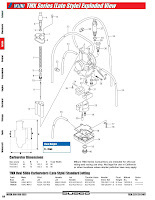 The diagram to the right shows that through the throttle range, different parts of the carburetor come into play to help achieve the correct mixture from idle to wot(wide open throttle). 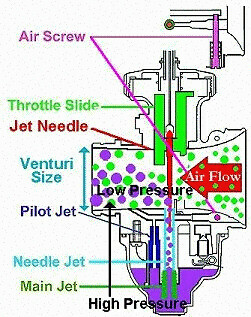 As you can see, by changing the idle jet, main jet, and by dropping or raising the clip on the needle, it is possible to adjust somewhat the entire range. However, if you find that you are dropping or raising the needle to the last slot and still not getting the results you want it becomes necessary to change the needle and/or the nozzle(needle jet). There are 3 different elements that can be changed to get the desired results. The first 2 have to do with the needle. One is the straight diameter of the needle, and the second is the taper of the needle. 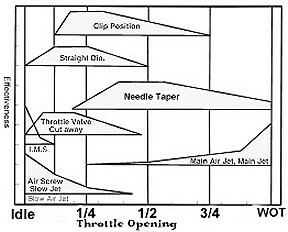 The straight diameter has more effect from idle to half throttle while the taper controls from roughly 1/4 to 3/4 throttle. 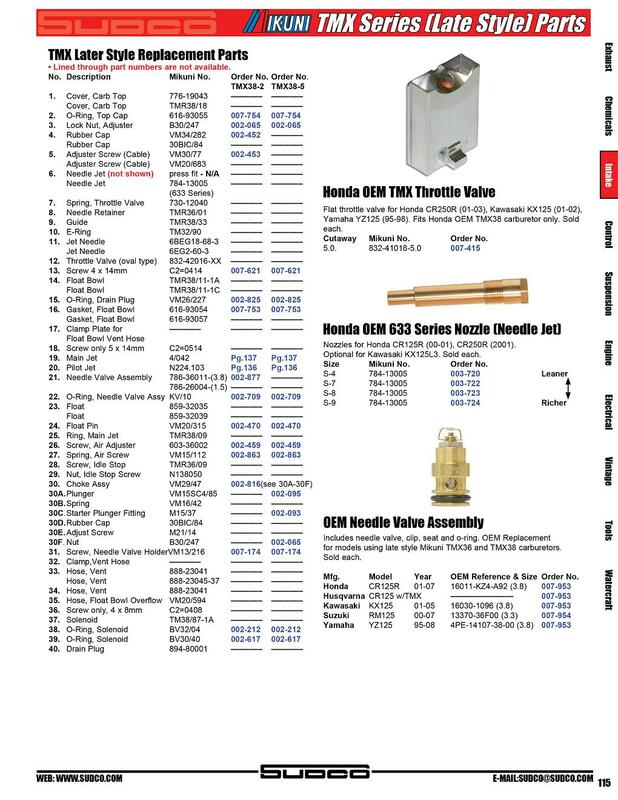 You can even buy needles with changing tapers to further control how fuel is metered, but again, in most cases, you can get good results with a single taper. A bigger needle will lean the mixture, where a thinner one will richen the mixture. Also, lowering the needle(raising the clip) will lean it, and raising the needle(lowering the clip) will richen it. 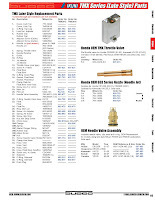 The nozzle is the 3rd element that can be changed to either richen or lean the mixture. In my case, I needed a leaner mixture. If your bike is stock, with the stock s-9 nozzle, and you are riding at higher elevations, chances are good that you'll have the same problem. Since every bike is different, and there are so many variables, it is nearly impossible to say you can jet your bike just like mine and have the same results, but using someone else who has a similar bike and rides in similar conditions can get you very close and at least get a place to start. The picture to the left is a good illustration of how these parts actually work to control the mixture. I've gone one step further than crossed eyed - I have gone cross brained! :D yea, my brain hurts.